We are in the Surth district in Cologne, the 2000-year old German city which overlooks the Rhine River. And we are all set to explore the simple but elegant nooks and crannies of this modern abode rendered by the architects at Corneille Uedingslohmann Architekten. 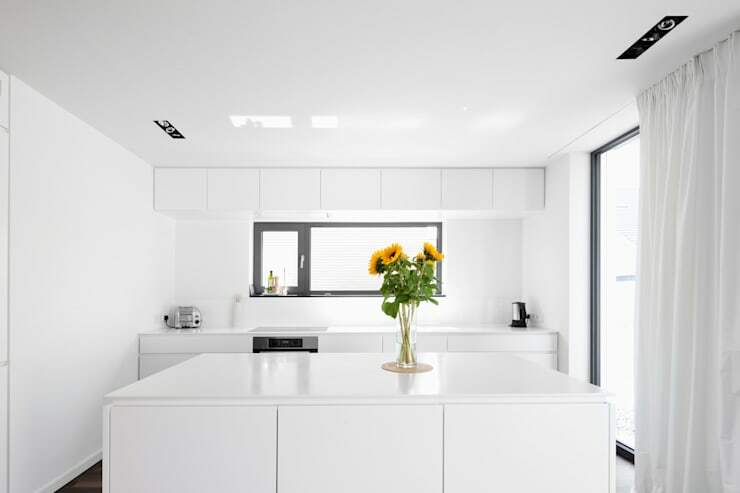 Pristine white dominates the residence both on the outside and the inside for a spacious, cheery and bright appeal. And the tasteful use of natural wood for the floors, the staircase and the furnishing left us impressed too! The minimalistic home makes use of neat lines, sleek designs, and subtle touches of lavishness to create a wonderful atmosphere for a modern family. Large glass doors and windows allow sunlight to bathe the rooms generously too. So read on to know more about this German beauty. 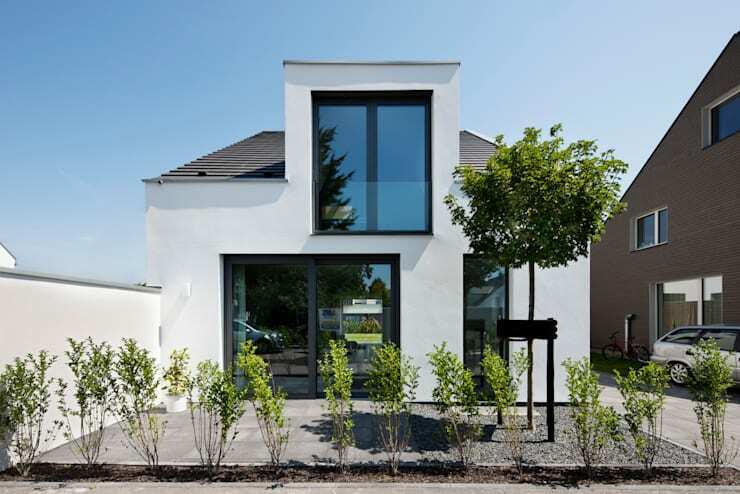 The structure of the house is simple yet elegant, with white and grey joining hands to create a conventional but smart facade. Large glass doors and windows help bathe the interiors in sunlight during the day, while lending a dash of pizzazz to the building. But what caught our eye the most is the neat array of lush plants edging the patio, one half of which is paved with grey tiles and the other half is lined with pebbles. A lone young tree stands tall among the pebbles and make for a pretty picture. The cozy dark grey sectional offers ample seating in the expansive and minimalistic living area, which gets tons of natural light through the large glass doors. A plush rug, a charming armchair and a light-hued wooden cabinet are the only other pieces of furniture here. 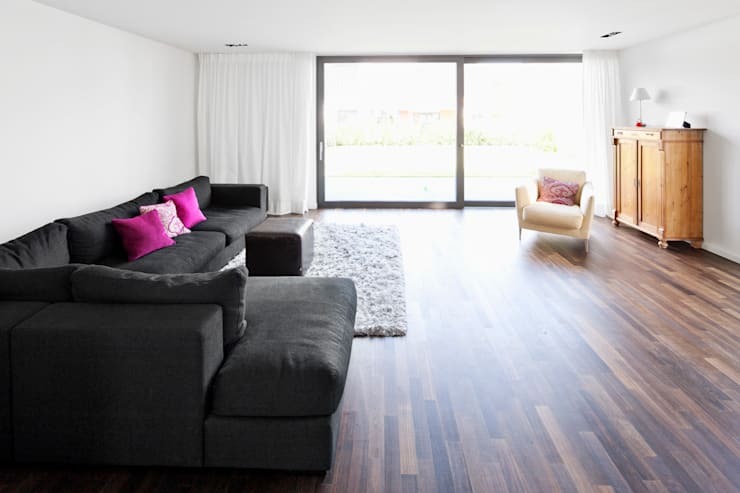 While bright white walls make the space cheery and breathable, wooden flooring contributes to the warmth factor. 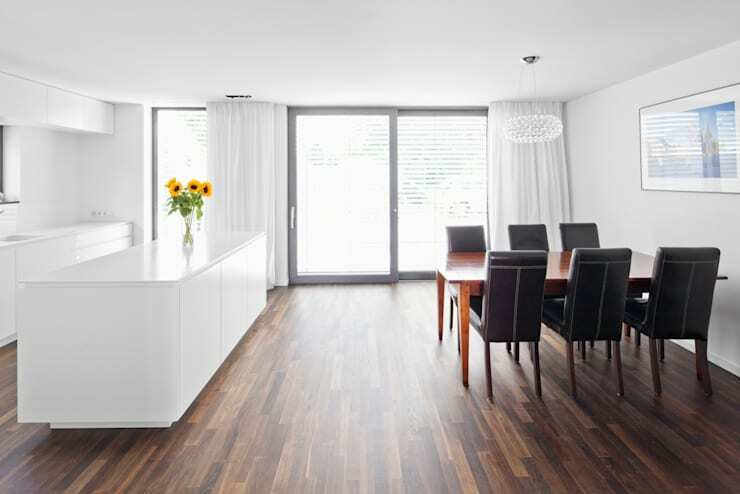 The spotless white open kitchen is a joy to behold, with its gleaming island and cabinets. All modern appliances have been neatly accommodated by smart niches, while sleek designs fill the space with a trendy charm. A glass vase holding a bunch of glorious sunflowers is the only splash of colour here, and hence stands out. The dining space is right next to the kitchen and stays bright and warm throughout the day. Large glass doors allow you to enjoy the outside view while enjoying a tasty meal, and a chic chandelier sparkles over the setting after sunset. The dining table itself is a sleek and elegant affair, surrounded by smart and dark leather chairs. We also love the flowing white drapes which can be drawn when the sun gets too hot or you need some privacy. Dark wooden steps contrast against white walls and a quirkily twisting balustrade for a unique visual impact here. 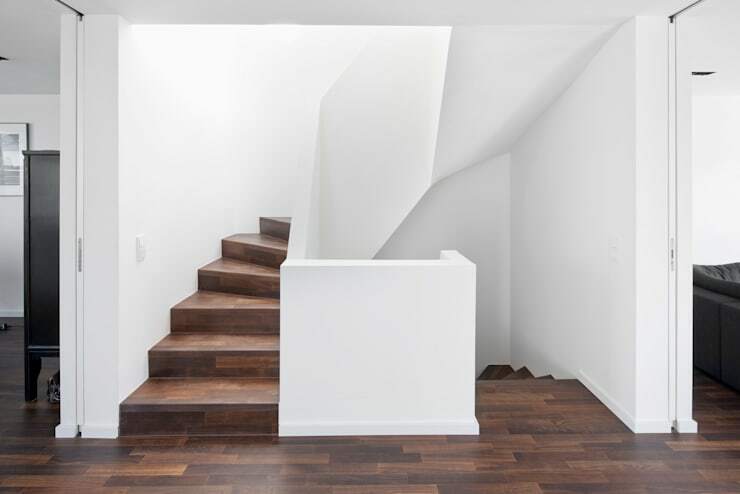 The staircase has been rendered with unusual twists and turns for an edgy feel, and is a highlight of the property. This attic bedroom comes alive with the sunlight pouring through the long window, and the gorgeous purple bedding. The purple hue stands out against the whiteness of the bed, the closet and the sleek bureau, while the wooden floor makes for a cosy aura. A stylish wicker stool, a couple of blue and chrome knickknacks and a delicate artwork make for the decor here. But what hogs the spotlight is the large mirror with a lavish golden frame. 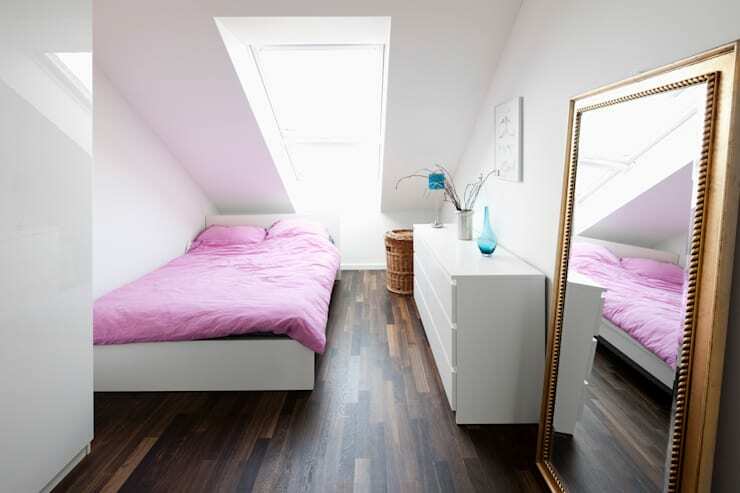 It not only makes the bedroom appear more spacious, but also adds a hint of glamour! 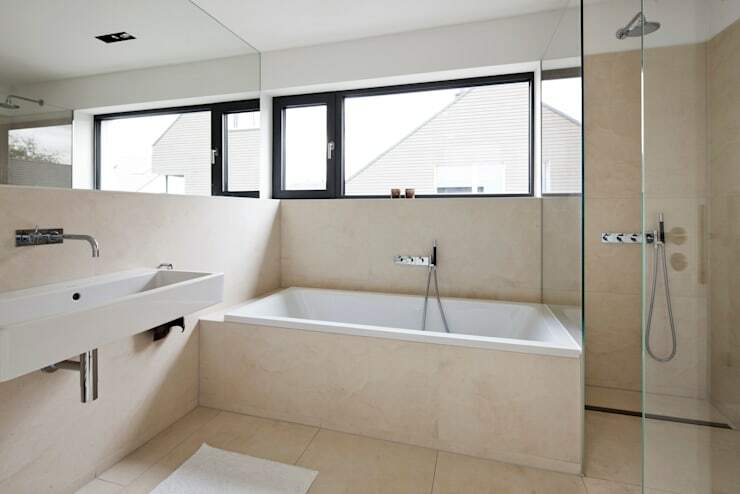 Creamy beige tiles add a soothing and sophisticated touch to this simple bathroom rendered in clean lines. The trendy sink and tub go well with the minimalistic steel fixtures, while a long glass window floods the space with sunlight. The shower enclosure is a neat glassy affair, while the long mirror adds extra space and brightness to the bathroom. Simple but contemporary designs, stylish minimalism, unique structural accents, and subtle pops of glamour make this German home a serene and cozy place to live in. Here’s another home tour to inspire you further - This Family Home Lets The Sun Shines In.